Cinnamon rolls and sugar cookies meet to create your new favorite cookie recipes. 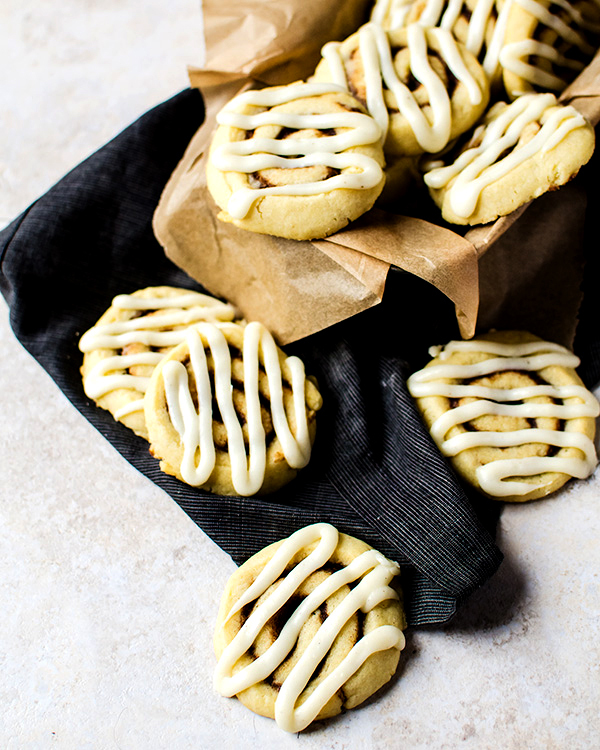 These cinnamon roll sugar cookies are a delicious no-chill cookie everyone will love! There’s nothing better than s gooey, ultra decadent cinnamon roll with a hot cup of coffee in the morning. It’s one of those indulgences you probably don’t get to have too often, so you savor every single buttery bite. I’ve been wanting to find more ways to incorporate those delicious flavors of cinnamon rolls in my life and cinnamon roll sugar cookies seemed to be the best way to do just that, but in less time, and much more shareable! 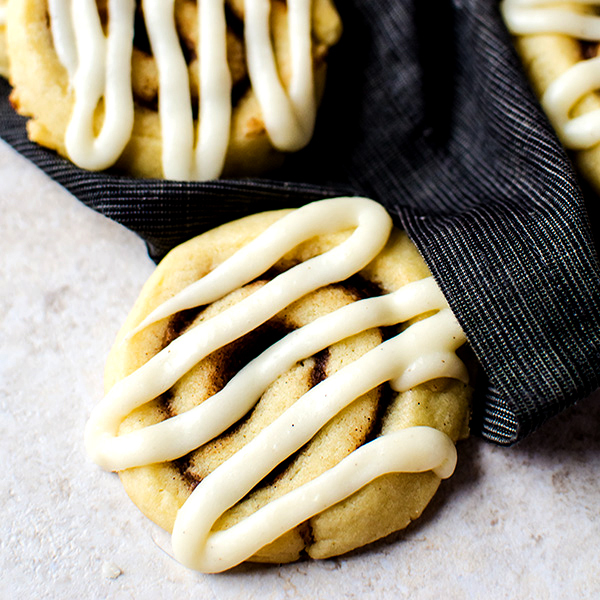 You want to know what makes these cinnamon roll cookies so amazing? There are two things. One, this recipe makes a lot of cinnamon roll sugar cookies. I got about 32. Second, and most importantly, you don’t need to chill the sugar cookie dough before you roll it up and bake it. So you can get them in your belly so much faster. I love eat these cinnamon roll cookies fresh from the oven, when the cream cheese icing can still melt into the crevices of the cookie a bit, but if you want nicer lines of icing on your cookies, wait until they are completely cool. Oh, and pro tip: Dunk these in a cup of coffee. Beat the butter and sugar together for the cookie until light and fluffy. Add in the egg and vanilla, then beat well. Pour in the flour and baking powder and mix until just combined. Divide the cookie dough in half. Lightly flour a flat surface and dump one half of the cookie dough onto your surface. Add a light sprinkling of flour over the cookie dough, then roll out into a rectangle. Mix together the ingredients for the cinnamon filling in a bowl, Spread half of it over the dough, leaving a small border around the edges. Roll the sugar cookies lengthwise and cut into 1/4 inch slices. Repeat with the second half of the the dough and filling. Place the cookies cut side down onto two parchment lined baking sheets, with about an inch of space between them. Bake for approximately 10 – 12 minutes. Leave on a wire rack to cool. Mix together the ingredients for the cream cheese icing, except for the milk. Mix until thoroughly combined. Slowly add the milk until the icing becomes thin enough to pipe, but thick enough to hold its shape. Like a lightly thinned paste. Pour the icing in a piping bag or a sandwich bag with one of the corners snipped off. Drizzle the cookies with the icing.